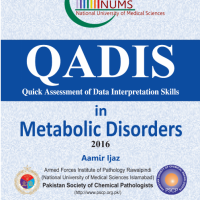 This is a joint publication of Armed Forces Institute of Pathology Rawalpindi (NUMS) and Pakistan Society of Chemical Pathologist (PSCP). All rights are reserved. No part of this book may be reproduced without written and explicit prior permission of PSCP. First Edition: 2016 This book is distributed to the health care providers free of cost and it is NOT for sale. Electronic Version available purely for academic purposes at: https://www.pscp.org.pk/.